In most dining establishments, the chef’s table, though increasingly ubiquitous, seems almost like an afterthought. Invariably, it’s a small piece of furniture tucked away in the corner of a hot kitchen or, if it’s a swanky spot, a separate room like the Dorchester’s in London where you can spy on the gastronomic action in air-conditioned, but bunkered down comfort. 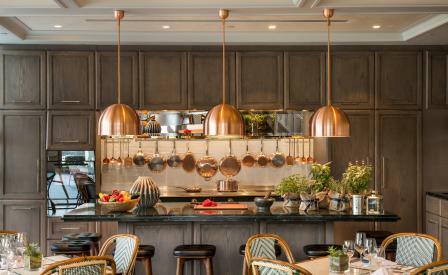 The newly opened 14-seater Chef’s Table at the Capella resort in Singapore sets a new benchmark in interactive private dining kitchens. Designed by the locally-based Brewin Design Office, this is not so much a chef’s table as it is a bolt-hole devoted to sybaritic dining pleasures. Privacy is assured with the drop of a row of linen curtains over the glass entrance, whilst the windows peek out through bamboo stands to the South China Sea beyond.